This upgrade is for your electric guitar and bass with thru-body controls and two 4-wire humbucker pickups (or equivalent). It gives you 102 pickup tones and a unique steam punk look. Your stock guitar is designed to give you a modest and inadequate 3 pickup tones. Don't you think it's worth a few dollars more to get a Grand Canyon Wide range of 102 Blues, Jazz, Metal, Surf, Country  plus the dozens of new and different pickup tones your stock guitar simply cannot produce? B.C. Rich, Campbell American, Chapman, Charvel, Collings, Cort, Daisy Rock, DBZ, Dean, Danelectro, Duesenberg, Eastwood, Epiphone, ESP, Ernie Ball, Fender, Flaxwood, G&L, Gibson, Godin, Greg Bennett, Gretsch, Guild, Hamer, Heritage, Ibanez, Jackson, Jay Turser, Kalamazoo, Kiesel, Kramer, Les Paul, Mayones, Michael Kelly, Music Man, Parker, PRS, Peavey, Reverend, Samick, Schecter, Suhr, Vigier, Washburn. Get unique tones for rhythm playing, funky leads, Fat heavy metal, and even glass-shattering piercing twangy tones that you never thought possible. Remove volume and tone controls and switches near controls. Attach upgrade to instrument front using empty control holes. Connect color-coded wires to a green solderless terminal strip. Connect pickup wires to a green solderless terminal strip. Connect output jack wires to a green solderless terminal strip. Your Hyper Tone Lab upgrade is now installed and complete. Although easy to install, we rate the installation at less than intermediate. It will take about 67 minutes to complete this upgrade. F-hole hollow body electric guitars without back access plate needs extra installation effort. You can use the listed tools, and follow pictorial diagrams; or you know a competent guitar technician that can install this upgrade. Two of the empty control holes of your instrument must be between 1.5" (38.1mm) and 3.4" (86.4mm) center-to-center. These two empty control holes must be 25/64" (9.92mm) diameter (minimum) to mount this product. User-preferred positioning installation may need an extra 25/64" (9.92mm) diameter hole that meets the center-to-center range. SW1 controls the Bridge south pickup coil. Center position is Off, Down is normal phase, Up is reverse phase. 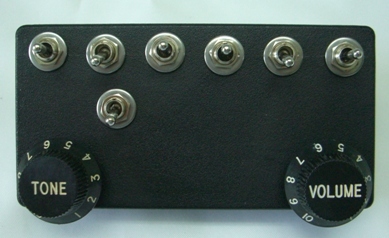 S5B controls whether the two Bridge pickup coils are in Parallel connection (down) or Series connection (up). With Switch S5B in the Up position, both coils must be On (either in normal phase or reverse phase) or you will not hear any output. SW2 controls the Bridge north pickup coil. Center position is Off, Down is normal phase, Up is reverse phase. 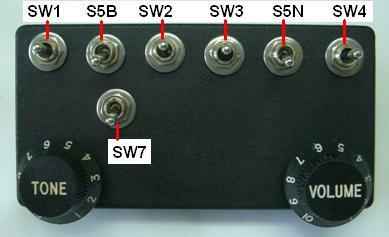 SW7 controls whether the Bridge north and Neck south pickup coils are in Parallel connection (down) or Series connection (up). With Switch SW7 in the Up position, both pickups must be On (either in normal phase or reverse phase) or you will not hear any output. SW3 controls the Neck south pickup coil. Center position is Off, Down is normal phase, Up is reverse phase. S5N controls whether the two Neck pickup coils are in Parallel connection (down) or Series connection (up). With Switch S5B in the Up position, both pickups must be On (either in normal phase or reverse phase) or you will not hear any output. SW4 controls the Neck north pickup coil. Center position is Off, Down is normal phase, Up is reverse phase.